Business groups scored significant wins Tuesday night in a number of hotly contested and very competitive legislative races from around the state. Candidates from both parties who support job creation through private sector economic growth were generally elected by solid margins. A net gain of three seats in the Assembly and one in the Senate allowed California Republicans to climb out of the super minority hole they found themselves in after the 2012 election, giving momentum to efforts to craft bipartisan solutions on major issues. Voters in the 16th Assembly District in the East Bay selected Republican attorney Catharine Baker to fill the open seat of termed-out Assemblymember Joan Buchanan (D-Alamo). 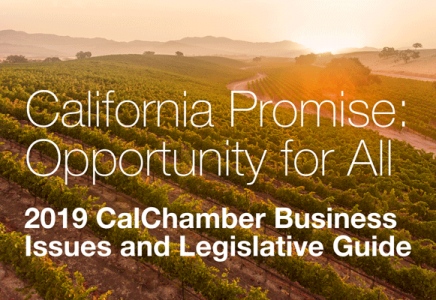 Baker’s election was a top priority for JobsPAC, the bipartisan political action committee co-chaired by the California Chamber of Commerce. The Antelope Valley-based 36th Assembly District saw Republican Tom Lackey win a decisive victory over one-term Assemblymember Steve Fox (D-Palmdale), returning this seat into GOP hands. Similarly, voters in north Orange County’s 65th Assembly District voted to send Republican Young Kim to Sacramento over one-term incumbent Sharon Quirk-Silva (D-Fullerton). In another upset in South Bay Los Angeles, Republican challenger David Hadley defeated another one-term incumbent, Al Muratsuchi (D-Torrance). The majority Assembly Democrats captured the Ventura County seat of Jeff Gorell, who ran for Congress, by electing Thousand Oaks City Councilwoman Jacqui Irwin. Irwin had bipartisan appeal to voters in this swing district and was supported by a broad cross section of business interests. The State Senate saw Republicans replace the termed-out Lou Correa (D-Santa Ana) with Orange County Supervisor and small businesswoman Janet Nguyen in the 34th Senate District. She defeated her Democratic opponent by a 20-point margin. The top priority for the majority Democrats was to defeat Republican Andy Vidak in the 14th Senate District. Vidak’s re-election was another major priority for JobsPAC. Vidak turned back his challenger by 10 points in a district that favors the Democrats by a 20% voter registration margin. But to be successful in deep blue California, the business community must do more than elect Republicans to the Legislature, so much effort remains focused on electing moderate pro-business Democrats when the opportunity arises. Races that featured two Democrats competing for open Assembly seats because of the state’s top-two primary system also turned out well for the business community. San Francisco County Supervisor David Chu won in the 17th Assembly District. Democrats Bill Dodd in the 4th Assembly District and Autumn Burke in the 62nd Assembly District, both priorities for the business community in June, finished the campaign with large victories over their Republican opponents. Democratic runoffs in Senate districts produced two new business-backed freshmen: Assemblymember Richard Pan in the Sacramento-based 6th Senate District, and Santa Monica School Board member Ben Allen in the West Los Angeles 26th Senate District. The 2014 legislative elections were important to the business community because of the change to the state’s term limit law, which now allows a member to serve 12 years in one house. To that end, 75% of the California Assembly seats are now occupied by either freshman or sophomore members who are eligible to serve until the middle part of the next decade. There are now six members—four Democrats and two Republicans— eligible to serve all 12 years in the Senate. With this November election, an almost-forgotten concept was reintroduced to the California electorate: the notion that there are now swing legislative districts in the state. For the first time in decades, four Assembly seats and one Senate seat have changed hands from one cycle to the next, creating a competitive environment that serves to keep incumbents close to their districts. Competition always benefits both consumers and constituents with better products, service and policy.